Looking north at Dearborn and Polk streets. Looking north at Harrison Street. The dedicated bike stoplight will help prevent conflicts between left-turning vehicles and bike traffic. North of Harrison. It looks like these will be permanently marked as loading zones to encourage loading vehicles to not park in the bike lane. Just north of Washington Street by the Christkindl Market in Daley Plaza. Hopefully CDOT will install “No snacking in bike lane” signs. North of Randolph Street by the Goodman Theater. Looks like the theater staff moved the sawhorses to allow curbside parking in the bike lane – bollards and/or signs plus ticketing should solve this problem. Just south of the river. CDOT managing bikeways traffic engineer David Gleason supervises the marking crew. Nice work gentlemen! This is just spectacular! Now, not to look a gift horse in the mouth, but I am wondering if there will be plates installed on the bridge over the river? Good question. Seems like it would be logical to install “Kathy Plates” here to link the existing Dearborn bike lane with the new one. Gabe says yes there will be plates. He’s obviously very devoted to his job. The answer came at 10:38PM on Saturday night. Good news! Glad you’ll be getting some of your eponymous plates. That’s weird– I’ve written to Gabe several times for help and never received any acknowledgement. Well, maybe when you have a piece of bike infrastructure named after you, like Kathy does, the commish will answer your emails. Just kidding, cyclists report that Klein has been remarkably accessible – he really seems to go out of his way to respond personally to inquiries, but he must get a zillion emails a day. You could also try contacting your alderman and/or calling 311. Like I said! Thanks Gabe. Regarding the parking in the bike lane during striping, in NYC, I believe the City allows this so that parking can be maintained while the floating parking is striped. It’s bit awkward, since it typically takes NYC DOT a few weeks to finish the same type of project, and the floating parking space is often used for double parking. If those droopy misapplied markings I see everywhere are thermoplastic then count me in the paint-and-repaint camp. I drove Dearborn this morning…much prefer the three lane that flows at a normal clip than the congested two lane. I see this as being a red herring for the city to point to and say, “Look – we care about alternative transportation,” but in reality, it negatively impacts the those who rely on Dearborn as an efficient transportation route. Thanks for the feedback; it’s interesting to get a driver’s perspective. I agree with TJH. This program sounds good in theory, as long as it runs on someone else’s street. That’s my perspective as a resident. I cycle daily and agree, it is a red herring. I think it is a bit dangerous, certainly for the first few weeks. Traffic on Dearborn is even worse today. Delivery vehicles are having a difficult time – and the lanes are not really active yet! I expect the lanes will have to be changed around the Federal Plaza – the buildings are often surrounded by security vehicles, and they are certain to disregard the bike lanes for security reasons. Two cyclists, proceeding in contrary directions, arrive at a taxi parked in the cycle lanes. Who has priority, the cyclist going into the Loop, or the one leaving? Who should risk their life more by shifting further out into traffic? I only ask as taxis are frequently found in the existing lane on Dearborn between the river and Illinois. Who gets the bill when the cyclist has to be scraped off the street? The taxi who caused the accident? One option for one of the cyclists would be to stop, letting the other pass. The Dearborn Street bike lane north of Kinzie will remain unmodified as part of this project. The Dearborn Street bike lane between Kinzie and Polk will prevent automobile access, except at the “ends” (at intersections, wherein a car can enter). ever the optimist, you are, Steven. 🙂 the point is “is enforcement actively being conducted to keep parkers out of the lane(s)”? Gabe? tell us what you’re doing to educate CPD that it’s better for them to write more tickets than scrape kids off the street after being killed by cars. I’m rarely the optimist on this blog. This reminds me, I need to update the Citation Tracker to monitor the rate of citations issued for parking in the bike lane. I think CDOT knows what’s at stake if the Dearborn Street cycle track is impassable for the very mode for which it was designed. True that! I’m the Pollyanana around here. That is not normal cyclist behavior. Cyclists routinely ignore any and all traffic regulations. This is a disaster for motorists. So do drivers. What’s your point? You missed the point , no traffic calming for bikes or cars or peds. I see head on collisions on the lake front all the time when it is crowded. Who is at fault there? even more interested to see how snow removal will work. Drainage along the curb has always been a problem as well. Good luck peddling through slush rivers. But now they’ll have a left turn arrow. Might work better. While it is nice, it is just paint, not real separation as seen in other parts of the world and indeed other parts of Chicago. Neither of the filmed situations should be possible on the Dearborn cycle track because it is separated by parked cars and flexible posts. A person would have to enter the cycle track with their car at the south end of the cycle track on each block. if not CPH and AMS. The photo of the USPS truck shows that it’s parked in a left turn lane, not a bike lane. Not a great design, though, to have bike lanes transform into turn lanes. With today’s installation of bollards on Dearborn, I see that they’re adding a diagonal line of bollards as a barrier at the transition point from parking lane to turn lane. We all know the bollards have kept usps vehichles and cars out of the bike lane on Kinzie…. This is awesome news! I don’t currently have a bike but this will make blading a little safer for us. Please, please, please for the love of god don’t rollerblade in the bike lane. It’s impossible enough in one-way lane of this width to pass you guys. Now you see how drivers feel. How is anyone going to stop people from in-line skating in the new bike lanes? They are presumably smoother than sidewalks and it would be better for pedestrians, too, to have them using the lanes, right? “presumably smoother than sidewalks”–not necessarily. Unfortunately new paint does not fill depressions or pot holes or smooth out the areas where there have been multiple patches put in. Unfortunately many bike lanes are long stretches of rough pavement. Not to say that Dearborn will be, but I know there are sections that are not “smoother than sidewalks”. Regarding drivers worried about additional congestion: when biking gets safer, more people will be motivated to leave their cars at home and bike. Everyone is entitled to safe transport, including cyclists, and people will learn to work with the new system. Europeans are way ahead of us on this one. We can learn more quickly by following their example. I think this is an unrealistic viewpoint. Cycling in the city will always be a limited niche – we can benefit much more with improved public transportation. Saying something will “always be a certain way” seems like an unrealistic viewpoint as well. That is possible, but I think a bicycle dominated transportation system is a very chaotic way of dealing with things where a well planned public transportation system will be better for all. I find it hard to believe that there will ever be a majority of people that would prefer biking to a good transit system. Jimbo, sounds like you’re due for a vacation to Copenhagen! I have been there, and I find Chicago and Copenhagen to be two totally different and delightful cities. I can never see chicago as a bike dominated city. We are not Copenhagen. We are far bigger, much more diverse community with the amount of suburbs, heavy industry, a huge downtown, multiple neighborhoods… We are a transportation hub for rail, air and trucks to the world. One convention at McCormick place would drown Copenhagen’s infrustrcture of hotels, cabs and restaurants. 8 million people live here. Has anyone played out what the needs of say, 30% of the population riding their bikes to work would do. Yes a lot less cars on the road. But would we have bike rage? I have already see bike rage on Elston. I bet a lot of have seen it too. That many bikes on the road at one time causes tension, just like the Kennedy on monday mornings. Who likes a nice ride with the kids on the lakefront on a beautiful saturday at 1pm? Not my cup of tea watching people run into each other. Thanks. Biking is great, but limited to enthusiasts, and not for everyone. Jimbo2K7, you say invest in more public transit, but where do you think the BRT lanes (because more rail is a pipe dream) would go? It would take up a lane that used to be the domain of cars… Anyway you look at it, the car is going to be negatively effected. And fun little fact for everyone. The reason we have paved roads is because of bikes. They were around before cars, and they weren’t mountain bikes, so bicyclists demanded paved roads. So, let’s kick it old school and take back our roads :). I am not opposed to losing a lane of traffic for a good reason. And I don’t think that rail is a pipe dream, we just have politicians with little vision. And paved roads were most certainly not developed because of bicycles. If a 5-8 mile (depending on how you look at it) costs 1.4 billion dollars (well over $100 million a mile), I think one can conclude that big rail projects, such as the Crosstown Connector, are pipe dreams. There’s been talk of this extension for years, with no result, and none in the forseeable future with the state of government finances. http://en.wikipedia.org/wiki/Good_Roads_Movement in regards to the paving of roads. I rode this tonight to check it out. Granted that the Lights are not working, I was almost killed by a cab turning left onto another street. He screamed at me to not be riding the wrong way. I can see this being a major problem with the design. Was the bike lane signed with signs or devices that on dictated it was closed? If so, you shouldn’t have been riding there and it may be an unsanctioned use of the roadway until it is complete. Yeah, you can’t blame the design for your near-,miss. Stuff like that is bound to happen if you ride the lane before the bike signals are working. They would have told you to stop and wait while the cab had the left-turn arrow. My question regarding this is are they going to make signs that say no left turn on red? I can see that becoming an issue. How are the signals going to work anyway? are they going to be on the same cycle as automobile traffic on Dearborn? Left turns on red are already illegal in Chicago, but I assume there will be “Left turn only on green arrow” signs. Bikes will generally get a green when northbound car traffic does, unless cars have a green turn arrow, in which case the bikes will have a stoplight. Trust me here: if you follow your bike signal, assuming a driver doesn’t make a flagrant lawbreaking move (in which case you’d be in danger on a bike anyway), you’ll be fine. Left turns on red are allowed onto a one-way street. If they are on their own cycle instead of being synced with automobile traffic, what Is to keep people from turning left on Red? The lanes are still completely barricaded, even for northbound traffic, and the signals are not functioning. The cab driver was right. Dedicated bike signals and no left or right turn signals for motorized vehicles should be a standard for bike lanes on arterial streets in large US cities. The closest Los Angeles comes to this is having both no-left and no-right turn signals at intersections along the Orange Line BRT route. This makes an enormous difference for the comfort and safety for cyclists and pedestrians crossing the street from the mixed use path that parallels the bus way. Even though its legal for people to ride a bicycle on sidewalks in the city of Los Angeles, the need for cyclists to follow the walk signals and push the button for activation is a major weakness in its design for cycling, There is still plenty of time for a person on a bicycle to cross the intersection in the crosswalk when the walk signal is blinking and yet that might not be what the police would consider within the rules. This also is a annoying disruption in continuity for travel on a bicycle compared to riding in the street where the traffic signals are timed for a less disruptive travel. The bicycle specific traffic signals on the left side of a one-way street enables the bike lanes to be kept next to the curb as the intersection is approached, instead of moved over to accomodate left-only or right-only turn lanes as is required under the MUTCD and also avoiding the potential conflicts from bus stops. Parked vehicles provide protection for cycling in lieu of grade separation. This is protected lanes on the cheap, but it can be effective if there are vehicles parked throughout most of the day. I’ve got a feeling that there will have to be some experimentation on plastic bollard placement at the intersections to keep vehicles from entering the bike lane. I’ve seen several instances where cities in the Netherlands used to put a rigid bollard at the beginning of a bike path in order to keep vehicles from entering. Having dotted lines through the intersection to connect the bike lanes also gives a sense of continuity for the cyclist. Bus stops are a problem when the bike lanes are on the right-side of the street. At least one Dutch city overcame this by switching the bike lane over to a bike path that runs behind the bus stop and then the cyclist is moved back to a bike lane on the street when this is cleared This creates a uninterrupted ride for the bicyclist and avoids the potential conflicts with the much greater mass bus. The standard treatment for bike lane installations in Los Angeles is for the stripping to disappear at virtually all the potential conflict points such as the approach to right turn lanes, intersections, driveways and freeway ramps. Its absurd to believe that this is goes towards creating a route thats within the stress tolerance level of most potential adult cyclists. In fact, its been my observation that most cyclists remain on the sidewalks where there are bike lane installations on arterial streets in Los Angeles. Bicyclists riding on sidewalks is sort of the canary in the coal mine for how safe most potential cyclists feel about pedaling on a street. Another standard treatment in Los Angeles for new bike lane installations is to put sharrows down when intersections are approached instead of taking away a left or right turn only lane. I’m hoping for a big uptick in the cycling rate down Dearborn St in order to encourage other cities to emphasize installing barrier protected bike lanes on primary streets. 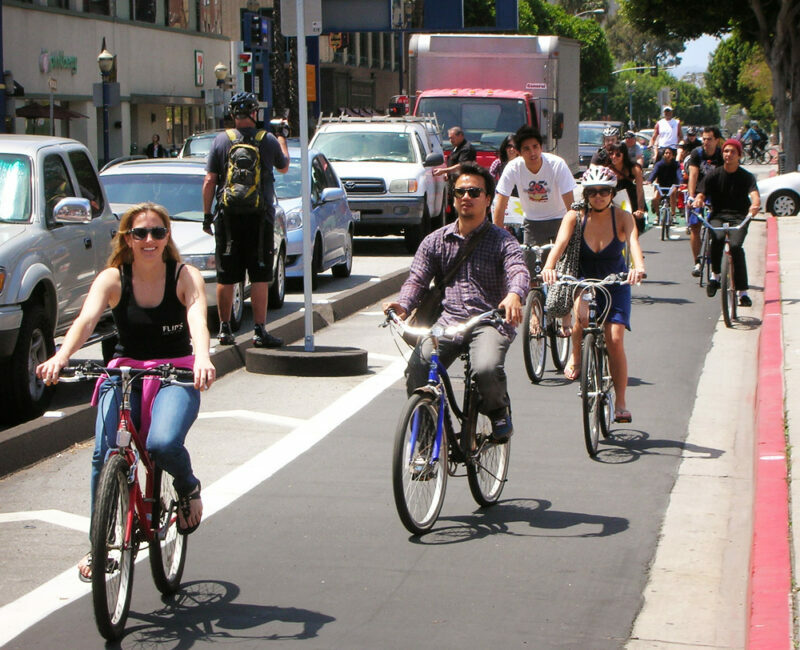 Los Angeles will probably gets its first protected bike lane just south of downtown on Figueroa St in 2014. How well Dearborn St works might encourage the LADOT to try one-way street protected bike lanes in the downtown area since they have already recently considered doing this. What about the loading zone that has been on the west side of Dearborn St., at about 720 S. Dearborn — south of Harrison? Are we Printers Row residents going to lose that? Yesterday, I saw a meter cop writing a ticket for a car parked in the newly lined parking area within the old loading zone. I asked if that was no longer a loading zone, and I was told “It says parking. As far as I know, you must pay to park in the parking lane.” This will be a terrible disservice for residents and businesses on this block of S. Dearborn. We already lost an important loading zone on the east side of the street a couple years ago — to make way for the expanded (double-sized) bus stop. Now we’re going to lose the loading zone across the street as well? On Printers Row, all the residential buildings have NO in-building or garage parking, so something as “simple” as unloading groceries from your car becomes a big hassle and nearly impossible to accomplish without getting a parking ticket. And try hailing a taxi on S. Dearborn without getting run over by a city bus (or now, a bicyclist). As an aging urbanite (and homeowner who pays top-rate property taxes), I do not feel that my needs are being considered. My life will now be much more difficult and dangerous. Hi Helen. Thanks for reading the blog and commenting. Let me look into the status of the loading zone and get back to you. actually makes things safer and more convenient. For one thing, it will be easier to cross Dearborn – you’ll only have two lanes of car traffic to cross instead of three, and there will be less speeding. That will also make conditions safer when you’re driving or riding the bus on Dearborn. And, of course, if you ever ride a bicycle, like my 76-year-old father does on a daily basis, the new lanes will make it much safer and easier to pedal on Dearborn. Thanks again; I’ll be in touch soon. John, I should let you know: I actually got a phone call from Gabe Klein after I posted this message (and sent him a comparable email). He kindly reassured me that we would not lose the loading zone on my block (despite the current confusion with the signage and lines). So, at least I personally am satisfied. Although, he did say that there may be a loss of a loading zone on the block north of Harrison — that engineers were currently working to review the situation. I appreciate his and your responsiveness to my concerns, and of course I would like Chicago to be a “world-class” city, but I am still a bit of a cynic about this plan. I don’t mind the slow-down of traffic on our street, but the loading/standing zone situation is really quite significant to the quality of life in Printers Row, for both residents and local businesses. And I still wish fervently for the return of the loading zone we previously lost on the east side of the street. I applauded the city when we got a Costco down here in the South Loop, but how are we supposed to shop there and transport those gigantic-sized groceries into our homes if we have no place to unload our cars? Bicycles will not help with that. Printers Row has long fought to maintain its status as a primarily residential neighborhood, and I am hesitant to have this new transportation system (designed largely for the benefit of Chicago business, if you listen to the Mayor) routed across my front door. I am not delighted by the idea of increased traffic — bikes or otherwise — funneled through my street. That’s just my two cents, as a dedicated neighborhood girl. Thanks for the update. Mike Amsden from CDOT confirmed that your loading zone will remain. It will be moved to the right of the bike lane, as shown in one of the above photos. Is there a commercial service for deliveries that uses cargo bikes that operates in this area? Seems like people who don’t or cannot use bikes would find that more convenient than driving to and from stores not too far away, including having to find parking on the return journey after unloading. Many of us use bike trailers for groceries. There’s more than one non-car method to tackle the problem. not if you do not feel comfortable riding. My grandmother never got a license. She would never consider learning to drive, she never felt it was safe for her.I know there are a lot of people who will never ride a bike on a busy city street for the same reason. My wife is one of those people. It is a non starter. Remember share the road, not own the road. Car vs Bike. Car always wins. It will always be dangerous to mix cars and bikes. Always. Even a driver happy to share the road with a bike will inevitably be forced into a confrontation. That is why I gave up my motorcycle in the city. Lost too many friends and had too many way-too-close calls. Btw, I was not able to pick up my dry-cleaning across the street yesterday because the cleaner complained that there is no place for his truck to unload and everything is all backed up. He’s not feeling the love for this new plan. Of course, he’s just one small business, and I am just one resident, and as the Mayor actually said, “it is only one street in the city.” It just happens to be *my* street — a primarily residential street that is now destined to have all the city’s business bike traffic funneled through it. Want to become a world-class city? Here’s what you do: Everyone ride your bike across Helen’s front door, twice a day, everyday. Thanks for the update Helen. I’m unclear on the issue with your dry cleaner. He didn’t lose a loading zone did he? Why is the truck having trouble parking when it didn’t before? I’m trying to understand this, Helen. Do you mean car traffic? What started funneling so much traffic through your street? It is Costco traffic or is there some other source? I can definitely relate to your concern because I live on a residential street with a ridiculously high amount of non-local commuter and event-related traffic due to proximity to a Lake Shore Drive on-ramp, but honestly I’d give just about anything to have a lane of car traffic replaced by quieter, cleaner bike traffic. The loading zones are important for sure, also to protect bicyclists so that they can anticipate where larger vehicles will be. Thank you for your reply, Helen. I understand your concerns. Is your block zoned residential? I’d like to see more monitoring of zoning relative to street design and vice versa, ideally with a clearer correlation between designed transit uses & adjacent building types, both historical & future. When a development that will alter zoning is proposed in Chicago, there tends to be much more of a focus, at least on the part of communities, on how the development will “look,” with the traffic and other functional studies (water/waste disposal, local energy needs, fiber optic access, for ex.) as add-ons that are very site-specific. Our straight-shot grid system really requires a more extensive overview, I think, especially since long, straight streets with their related infrastructure often pass through many areas with varied zoning. Complete Streets is great as a starting point, as can be mixed development, but it’s important to remember that the urban world is a sort of body: arteries & veins (the streets, sewers, etc.) support the organs (buildings, large tracts) as much as organs that are too demanding or defective can overtax their conductive routes & thoroughfares. As your reply points out, the medicine can sometimes risk dangers greater than the disease, but I’m hopeful in this case that especially for your sake, that the car traffic will in fact diminish, as has occurred in many settings in Europe where bike lanes were developed. Idling vehicles adds to your quality of life? hmph! who knew! Cars temporarily parking in a loading or standing zone don’t necessarily leave their engines running. I always turn my engine off and just turn on my flashing lights, as I think most people do. However, I expect an increase in idling vehicles that are bogged down in congested traffic on my street, due to the reduced lanes for cars. What evidence can you cite that shows more lanes equals less traffic? We’d love to see that study… please share it. More lanes does not equal less traffic, but fewer lanes (on this street in particular) will surely mean that the existing traffic will be congested, often slowed to a crawl and “idling” as the cars wait for a chance to move forward. We are already quite bogged down at rush hour, and I do not expect a decrease in cars — only slower, angrier, more frustrated drivers with idling cars in addition to a significant increase in bike traffic (as well as traffic accidents). Angry drivers aren’t cured by more lanes. Until you provide a study that you can cite to the contrary, I’ll consider your comments rhetorical. My evidence is the laws of physics: Same volume through a smaller tube creates a “bottleneck” and slows down the movement (thus more idling by the existing car traffic, angry or not). A nice idea, but that’s not how traffic works. Traffic is based on behavioral patterns. Ever wonder why traffic engineers exist and we just don’t leave it to physicists? Adding capacity on roads A and B is fine, but when those roads are blocked, drivers will go to roads C and D, which offer less capacity and impact traffic further on A and B (gridlock, etc). Adding lanes doesn’t add capacity, necessarily. I am curious how the Mayor’s team of engineers selected S. Dearborn Street and Printers Row (a primarily residential strip) for the dubious honor of bearing the brunt of this new transportation plan. Wouldn’t State Street have been a better idea? Remember the old days, when cars couldn’t drive on State St? Only public transportation. I say, let’s return to that plan — remove the cars from State St. (which is a commercial shopping street) and leave it for the buses and BIKERS. I love that idea. Maybe one lane for taxis. I don’t need to drive my car to Macy’s, but I do need to drive my car to my front door, and the Mayor’s plan is not helping me or my neighbors. I think this is a better plan than the Dearborn plan. Make one street a bike and pedestrian mall. That is way safer than the Dearborn plan. My final word on this subject, John (and Gabe Klein): I want to report that as of today, the loading/standing zone across the street from me — at roughly 7:20 S. Dearbon — is *still* labeled (on the street — in white line-paint) as “Parking.” And there is no street-line indicator that the space is in any way different from the rest of the paid-parking that surrounds it. I just now saw some guys with neon vests (don’t know who they work for, doing some type of “work” on the street), and I asked them if they know if that space is a loading zone or paid parking. One guy said, “It says parking.” Another guy said, “I wouldn’t park there without paying.” They probably don’t work for the city (they became suddenly shy when I tried to find out who they were and who they worked for), but… bottom line is that I consider my loading zone still in jeopardy and it is currently *not* functional as a loading zone. Update on 12/14: Yesterday afternoon some crew came by and crossed out the “Parking” message written on the street and wrote “Loading Zone.” Thanks Gabe Klein!